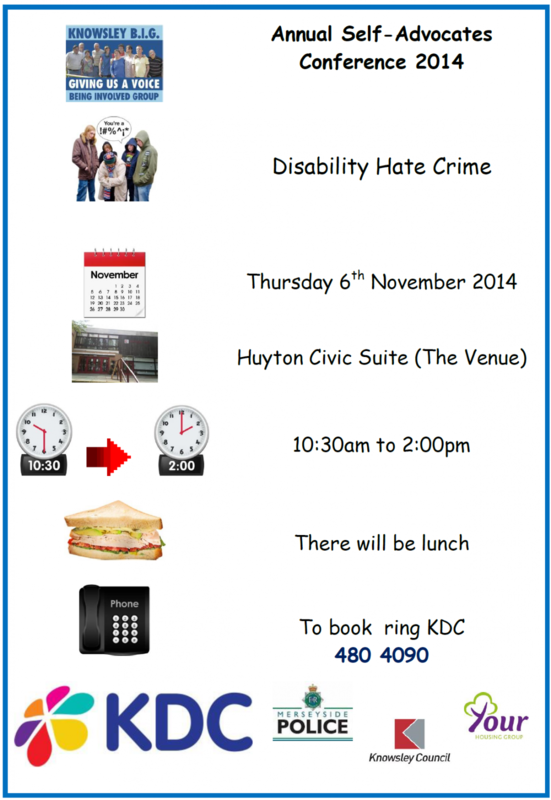 On Thursday 6 November, Self-advocates from across Knowsley will hold their 2nd Annual Conference. Once more, the key theme for the conference will be Disability Hate Crime. The day will focus on how things have improved since last year in relation to how people can report incidents as well as what more needs to be done to help people feel safe and for victims to feel supported. Delegates will have the opportunity to put questions to a panel of specialists from the police, the local authority and other agencies. The conference is free and runs from 10.30 to 2.00 at The Venue, Huyton. Lunch is provided. If you are interested in joining us, please contact KDC on 480 4090 to book a place.